We decided we needed to be outside more, but living on the Mississippi has its drawbacks, one of them being hordes of nasty mosquitos and flying insects that bite, bite, bite. 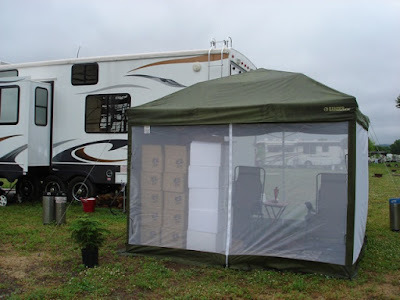 We settled on a great little unit from Gander Mountain, It's The "Combo Canopy" and so far it's fitting the bill nicely. 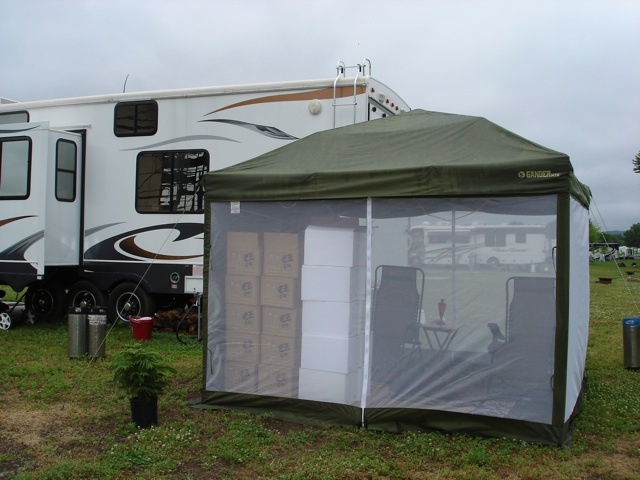 It features sun filtering screen and attachable inner walls to block wind and rain. It sets up easily, but the ten minute set up is not really realistic, being two very experienced canvas toters, it still took us a good half and hour to put together. So far it's worked out great, we've decked it out as our outdoor living room, but Doyle just had a major shipment of bottles delivered for our upcoming Event, so the tent is full of cases of bottles needing labels at this time. I noticed this morning that a profound change has taken place in my lifestyle. I used to get up and watch the morning news on TV. Now I get up and turn on the computer and check the fulltime RV blogs we are following. It's the only news I'm really interested in now. It's sure nice to check in on everybody and see how they are handling things, it's almost like we are this great big extended family who understand each other more than anyone else. We understand what it's like to wake and and wonder, at first, "where the heck are we and what day of the week is it?" 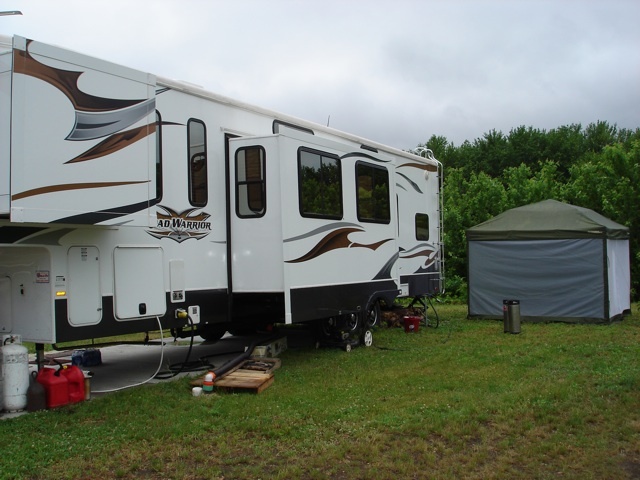 We are the only ones who truly appreciate a long hot shower, a large RV Lot with a view and an easy traffic day. We eye bridges and overpasses as if we are looking for snipers, seeing if that 14" clearance is for real. We view trees overhanging the road as potential enemies and laugh uneasily when we see that the last one was trimmed in the perfect outline of an air conditioner topped coach. We watch for gas stations with a good approach and large parking lot, taking notes for the next time we pass through. We have an "Oh Well" attitude about gas prices, regardless, we must get there and whining won't change anything. Our main preoccupations are weather, food and did I mention weather? We have been, or are going through, parting with everything that at one time meant something to us. We can tell just by hefting it, the weight of just about anything, and tell anyone who will listen where it could fit in our rig. We all struggle with finding a balance with our diets and exercise. We have problems with some or all of our families not understanding us. Some of us have had to leave the road and seek stable shelter due to health or financial reasons, among others. The rest of us are in it for better or worse, come hell or high water, this is our life and there is no going back. A house is a strange place to is now and holds no comfort or implied stability. We are a new breed of nomads who are struggling to find a place for ourselves in this great country while not being tied to the traditional view of the American Dream. It is not as easy as it looks, nor as romantic as it sounds. There are many obstacles to face, and many challenges ahead. But that's the whole point. We are moving ahead. Most of us won't (or can't ha, ha), back up. To those of us who are still roaming and living the dream, I lift my morning coffee cup to you in a toast of Brother and Sisterhood. Only you can understand how I really feel this morning and I thank God for you all. In his "Skeptical Essays" Bertrand Russell said "There is a stark joy in the unflinching perception of our true place in the world, and a more vivid drama than any that is possible to those who hide behind the enclosing walls of myth"
very well said. I can't wait to be a full time RVer. What a great post!!! Thanks - got such a good feeling while reading. Was out 6 months last year and 3-4 months a year when my husband was alive so never made it to full timing as was our plan. Makes it all the more fun to read the blogs of those of you who are enjoying THE life. Thanks for letting me travel, vicariously through you. Happy Travels. Thanks for the comment on our blog. I can give you more info and pics of whats under the carpet runners. Just drop us an email. We like your blog, nice job!